Tuna goes surprisingly well with marrow and the topping to this Tuna Stuffed Marrow Recipe becomes lovely and crispy as it bakes. Heat the olive oil in a large deep frying pan and add onion and garlic. Fry gently until soft but not too brown. Stir in tomatoes and puree and bring to the boil, simmer for 10 – 15 minutes until thickened. Stir in olives, basil and tuna, trying not to break the tuna up too much, season to taste. 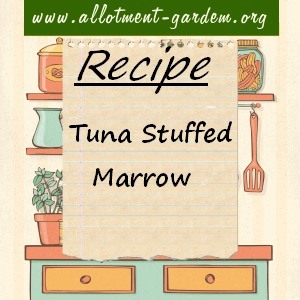 Place marrow in an ovenproof dish and fill hollow with tuna mix. Sprinkle over cheese and breadcrumbs and bake for 15 – 30 minutes until marrow is cooked when pierced with a knife and topping is golden and crispy. Thank you, I’m trying this one out this evening with one of my glut of marrows !! Love this recipe!! Add a bit of spice livens it up even more!!! Have made this twice; it’s really nice and filling. I left the olives out as I didn’t have any; it was still very tasty. Fantastic recipe, and I even take the leftovers (if there are any!) to work for lunch the next day. Not tried reheating in the microwave but it’s good cold too if you take it out of the fridge to eat at room temperature.